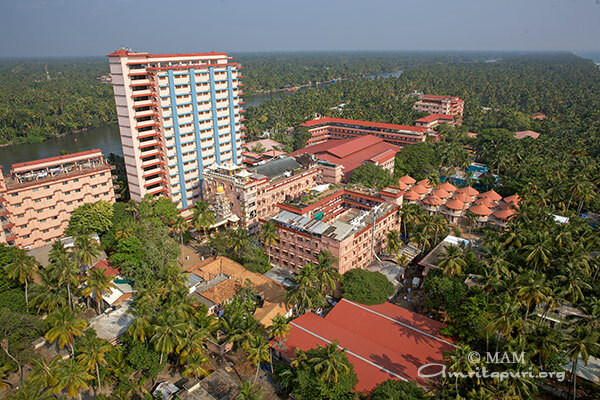 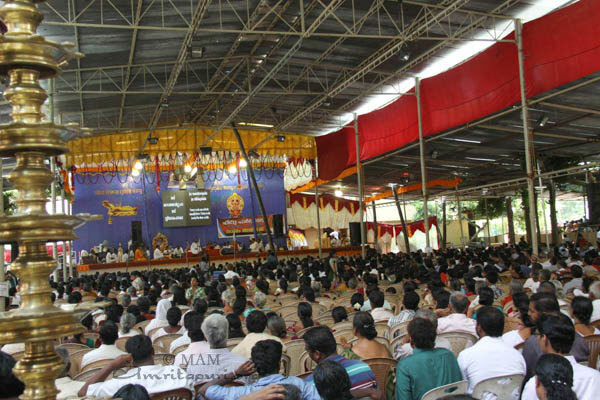 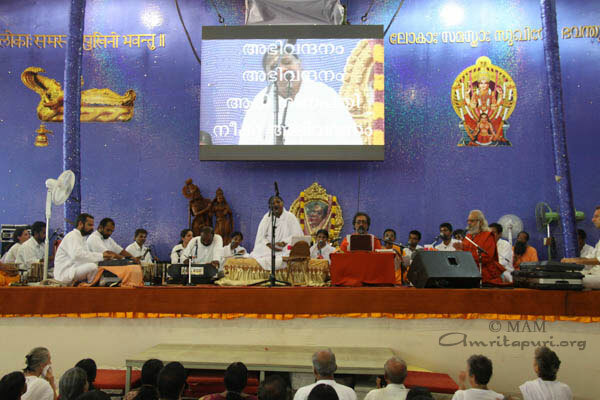 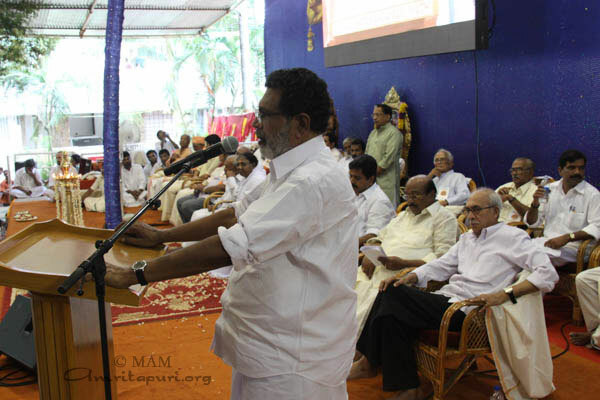 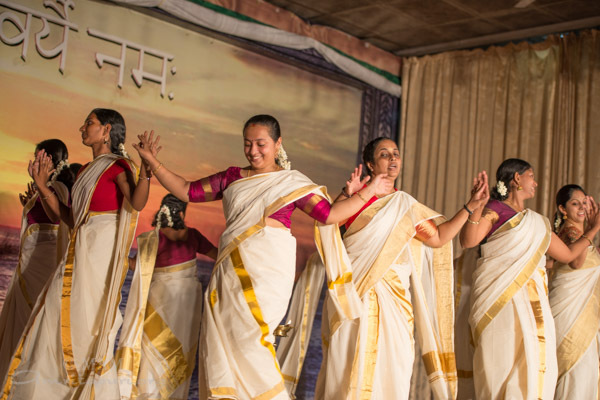 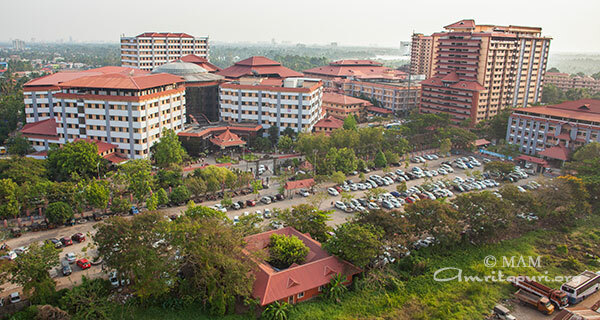 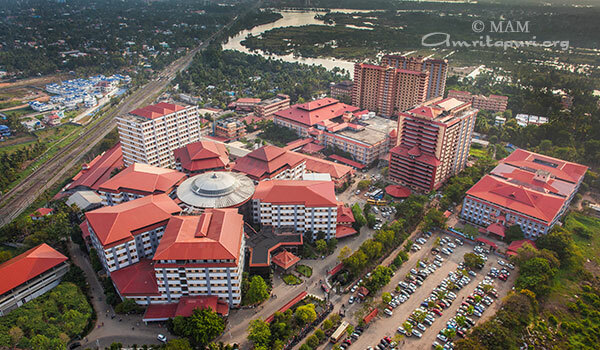 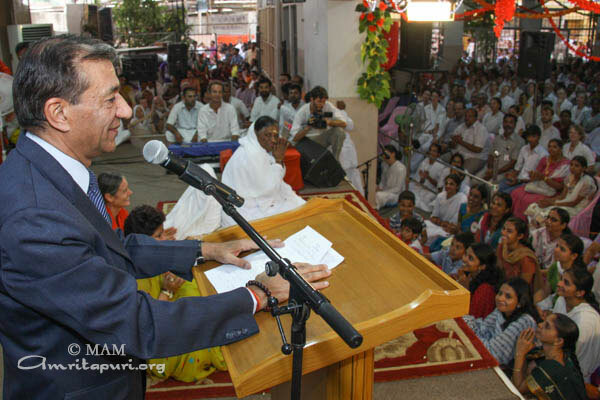 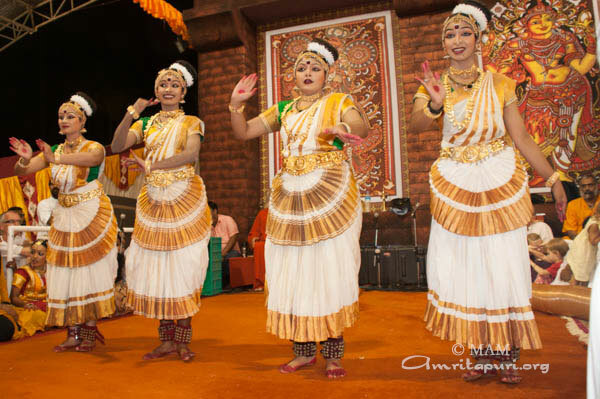 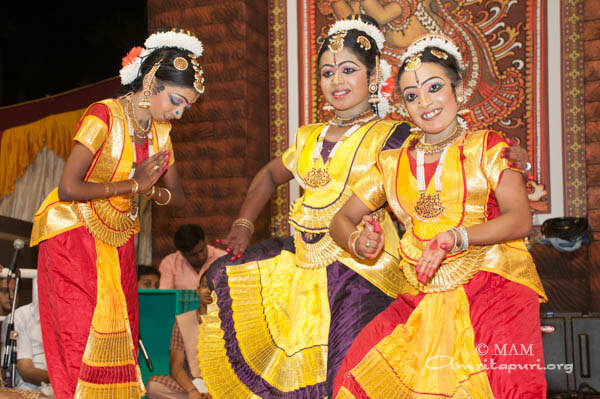 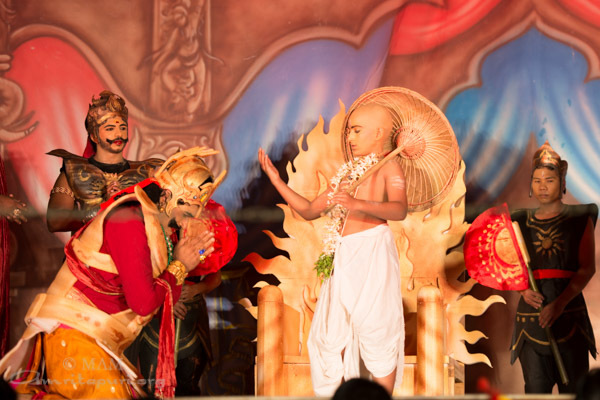 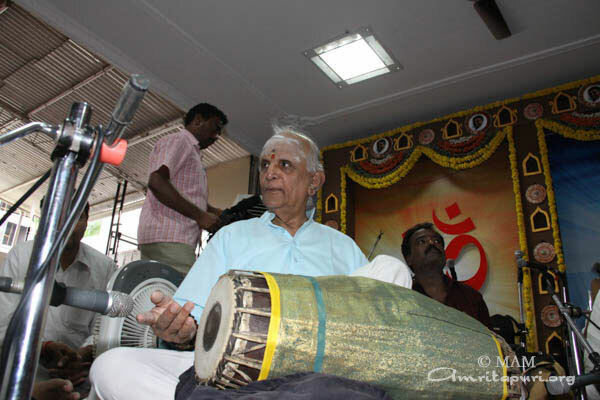 Every year Onam is a time for great celebration here in Amritapuri and this year was no exception. 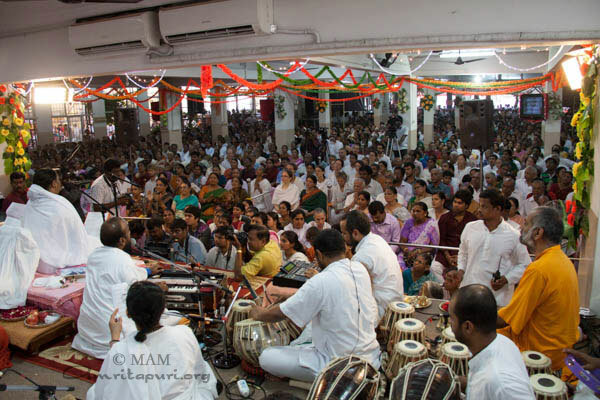 Early in the morning the hall was full of people in anticipation for the day’s festivities. 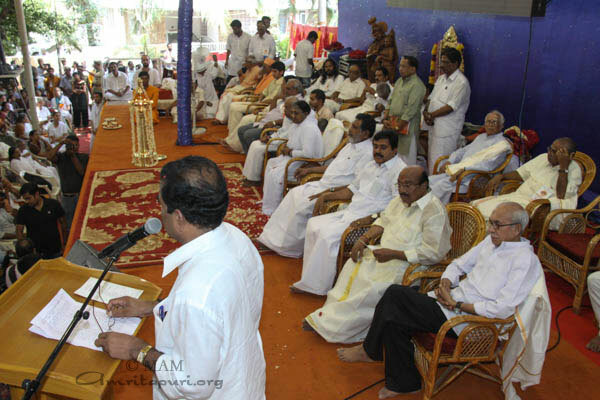 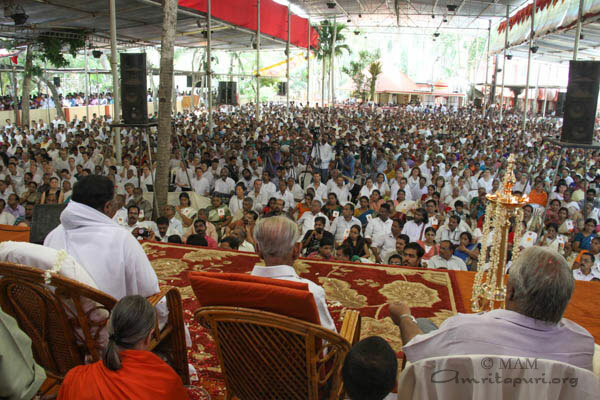 They didnt have to wait long as Amma arrived on the stage before 10am and gave her Onam message to a packed crowd. 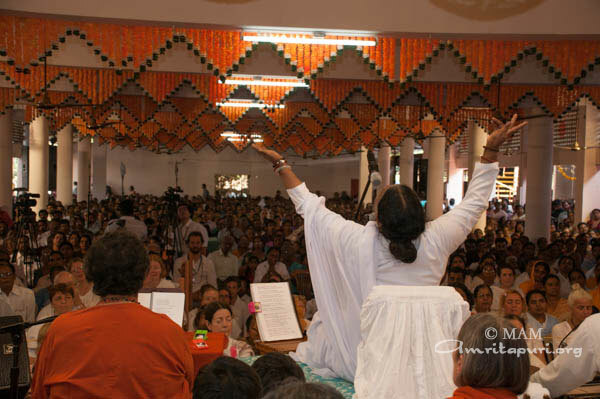 At the of her talk Amma lead the hall through a joyous rendition of Bandalo Bandalo and asked everyone to clap their hands with those around them. 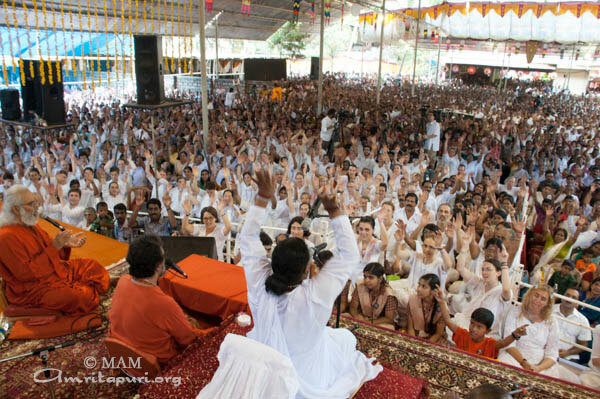 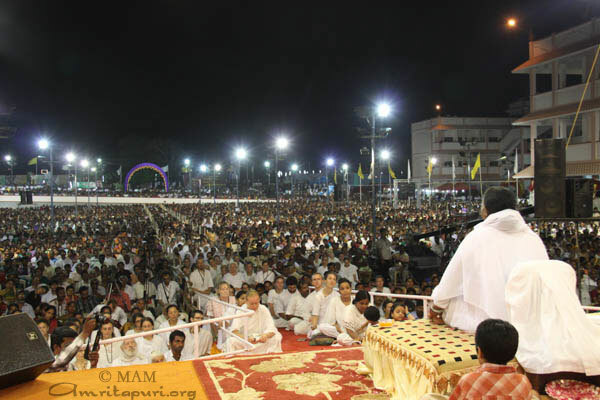 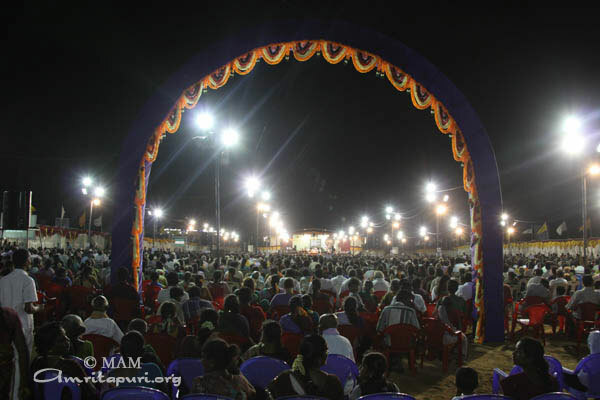 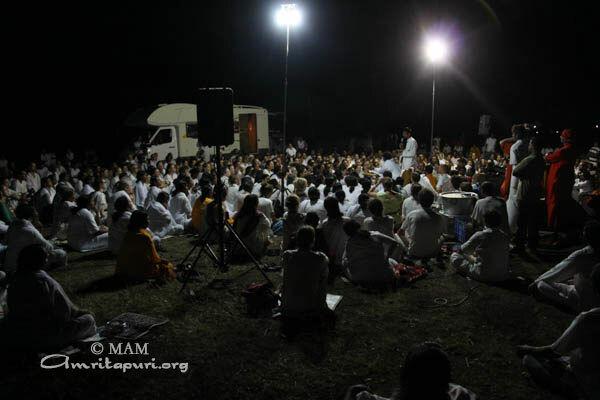 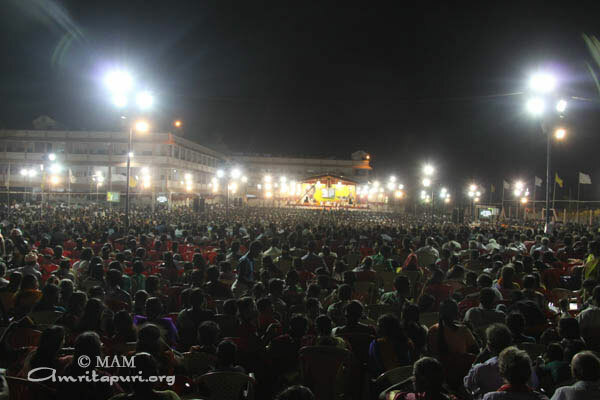 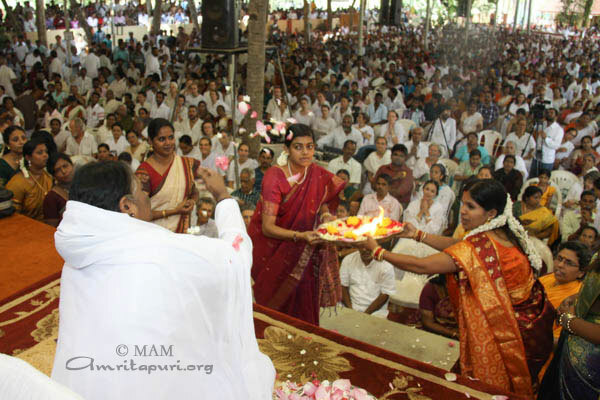 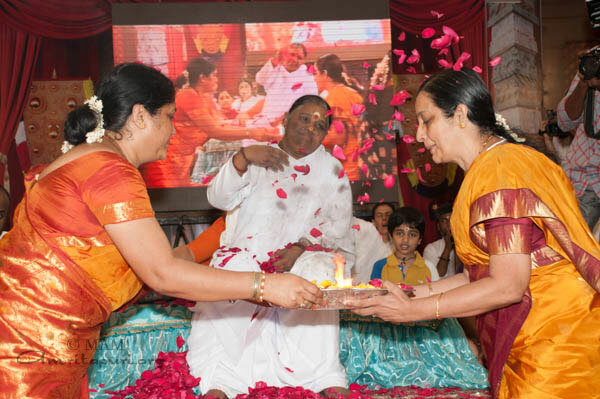 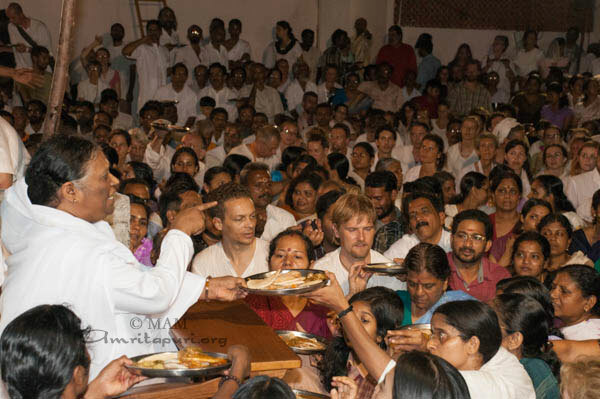 Then Amma served a special onasadya meal to all the thousands of people in the ashram which took several hours. 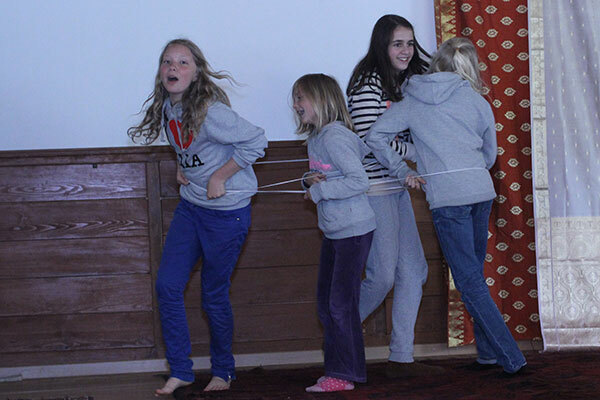 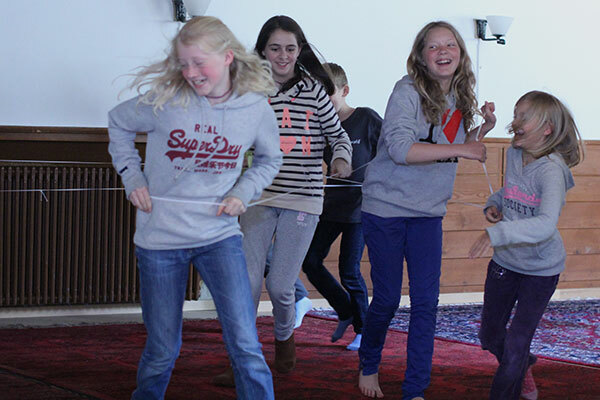 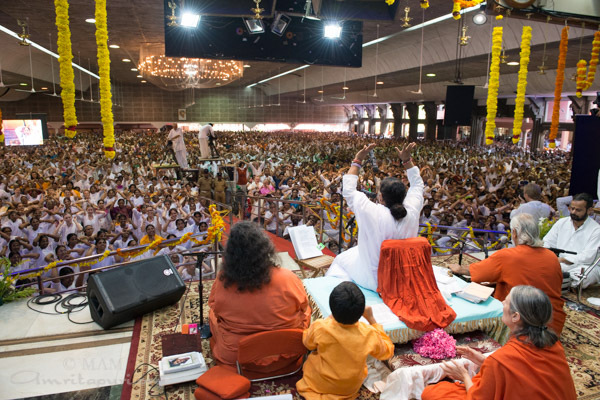 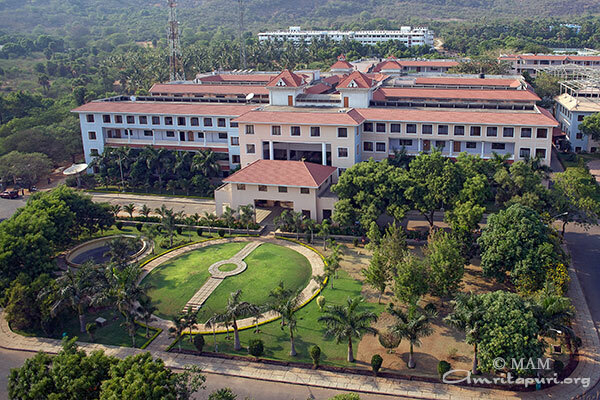 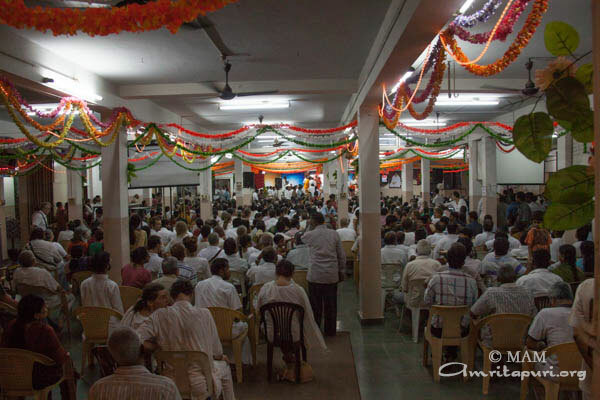 All ate in the hall together as one big family…even the biggest of ashram resident. 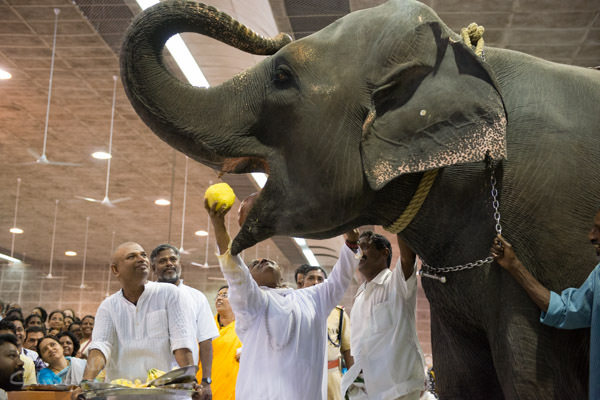 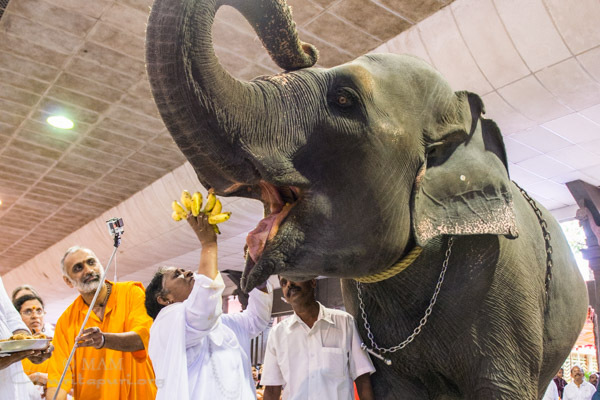 As it has become a yearly tradition, Amma served Lakshmi the elephant the large portion of Onam prasad. 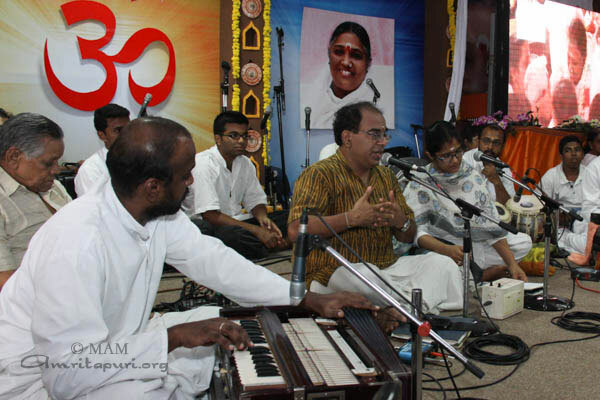 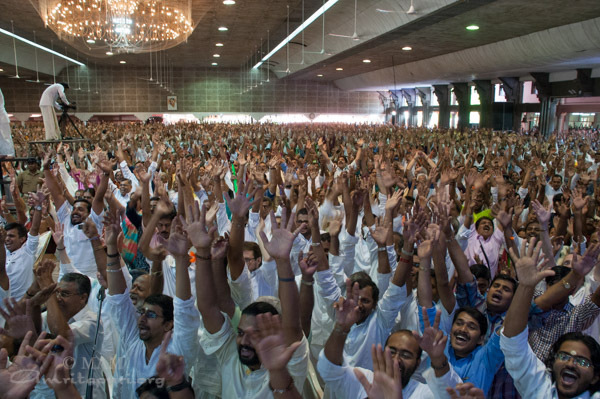 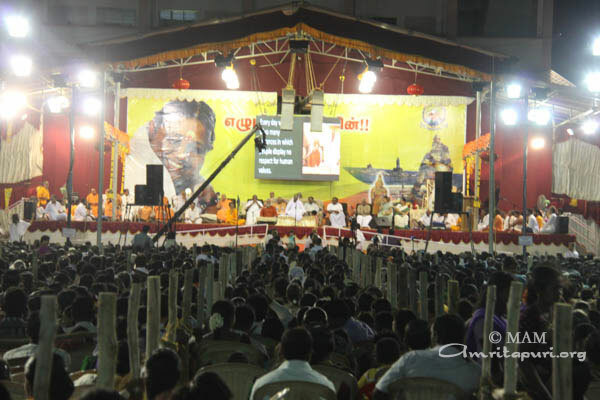 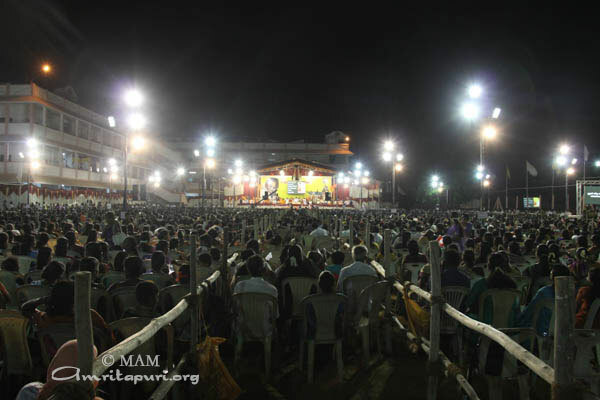 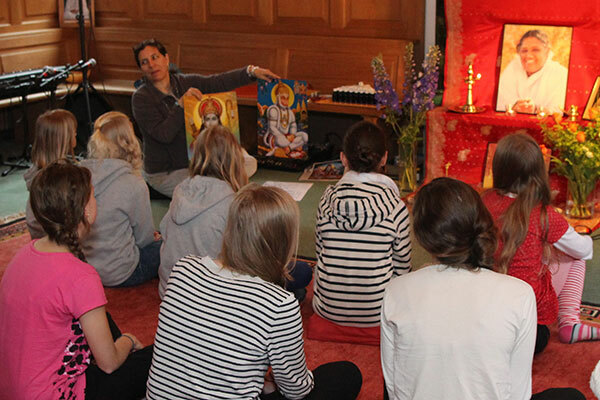 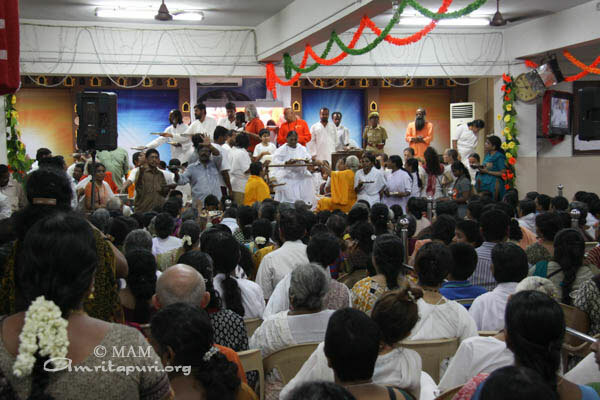 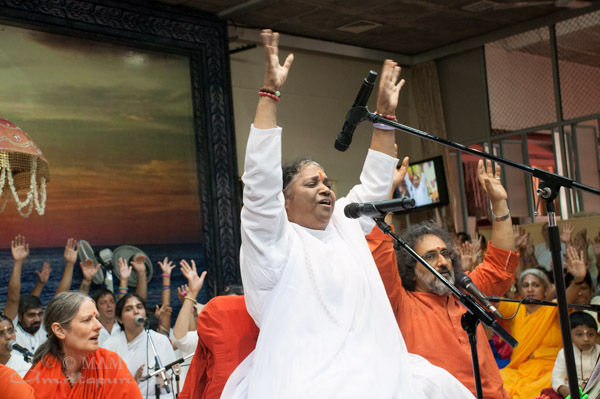 Later in the evening after bhajans, Amma came back to the hall to participate in the cultural programs. 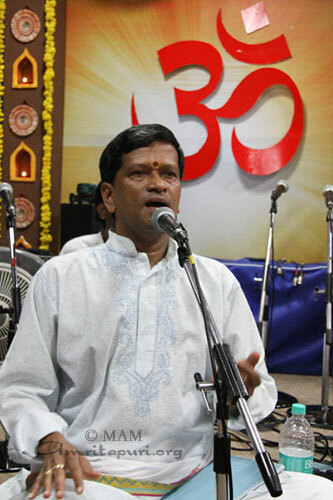 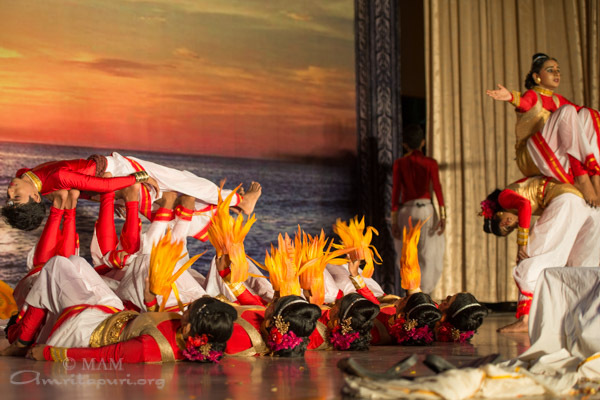 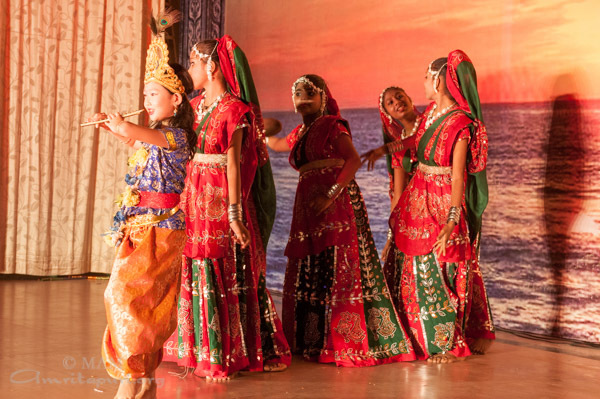 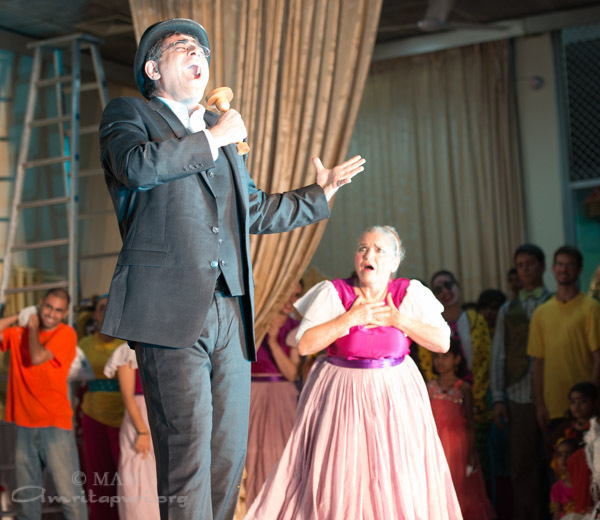 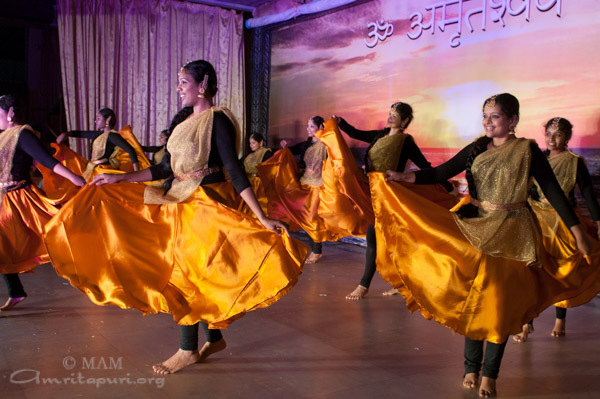 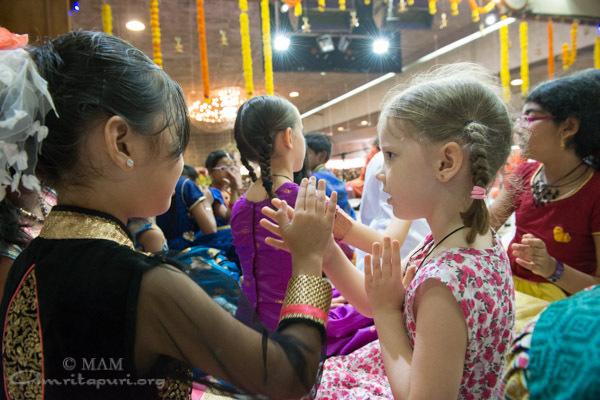 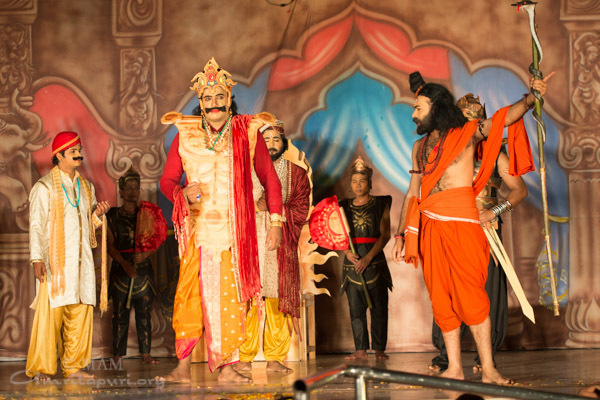 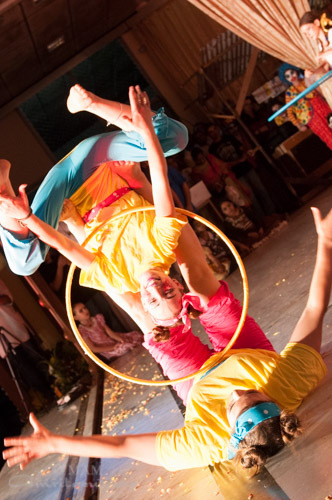 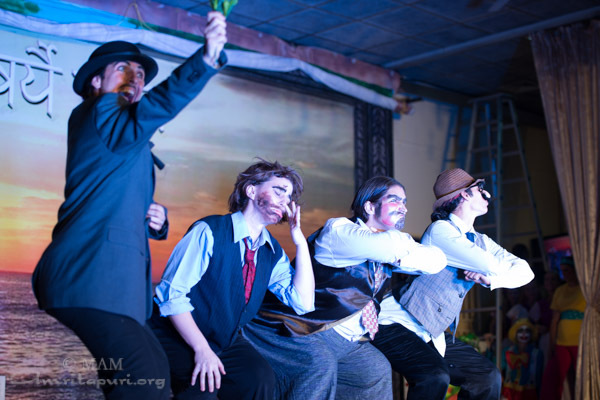 A huge variety of performances delighted the hall performed by ashram children, residents, westerners and brahmacharis. 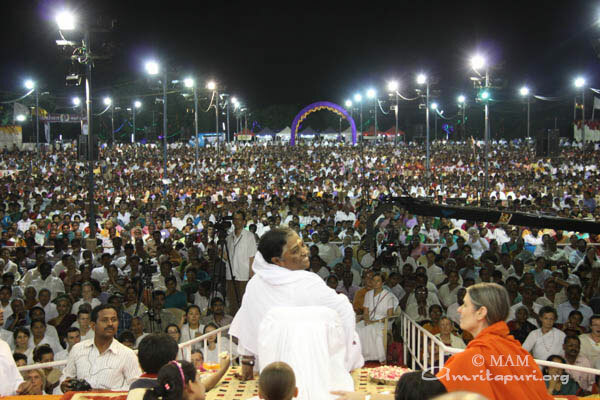 All finally reached a crescendo when around midnight Amma led everyone in singing – La Le Lale La Le. 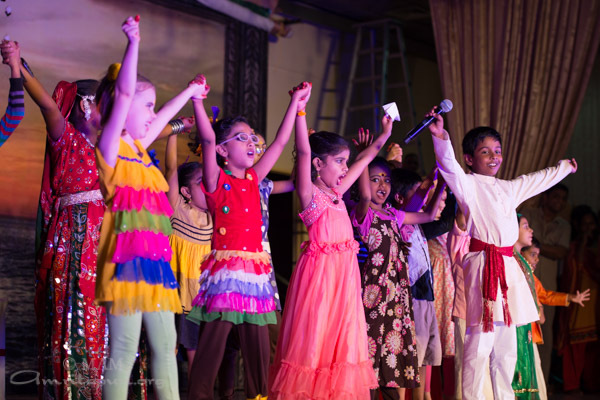 The whole hall was cheering, singing, and swaying with the music to bring an end to amazing day. 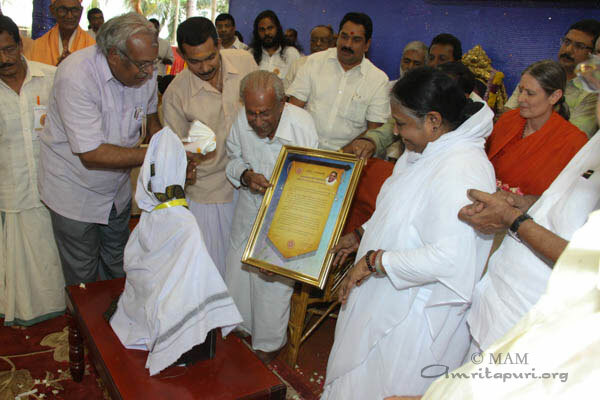 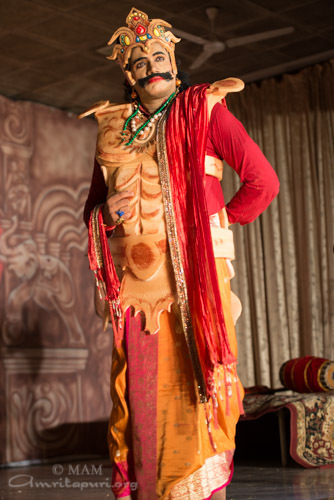 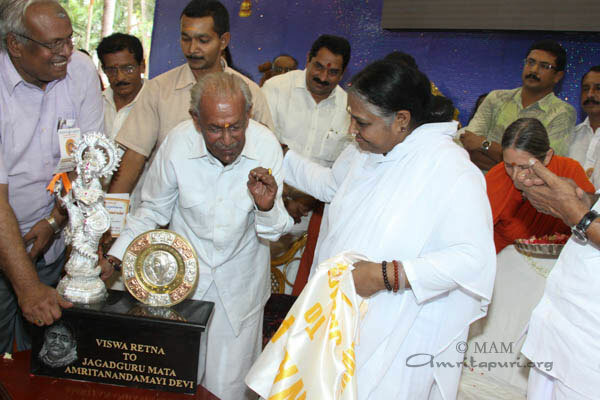 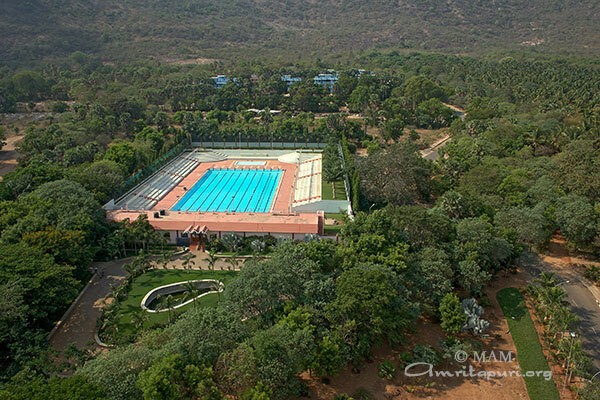 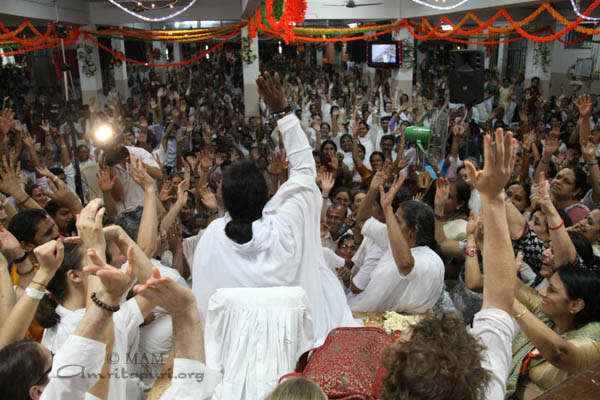 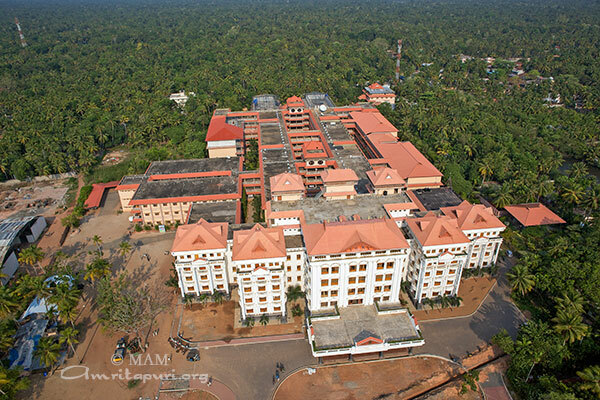 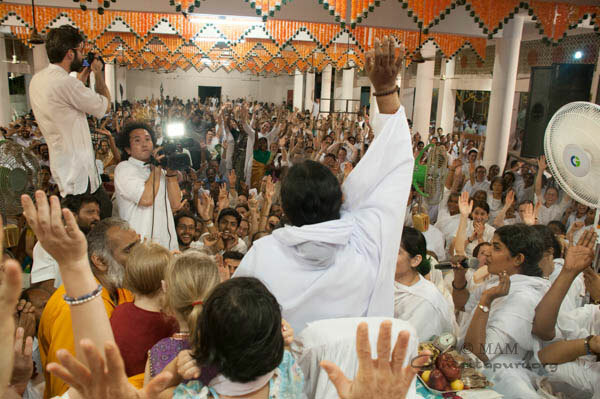 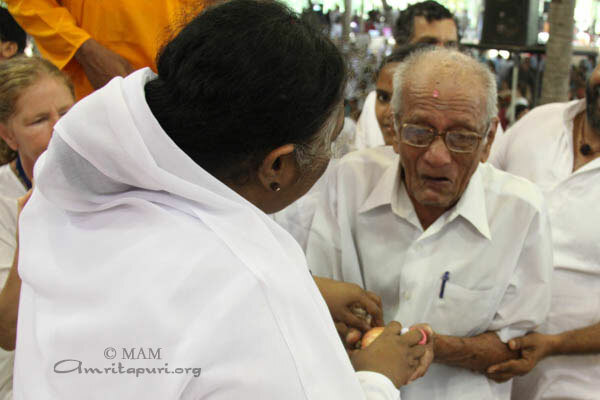 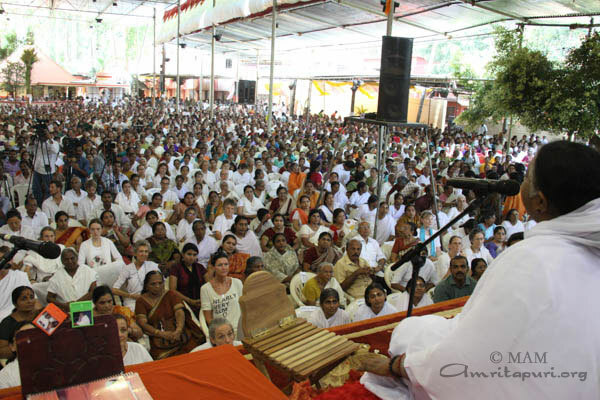 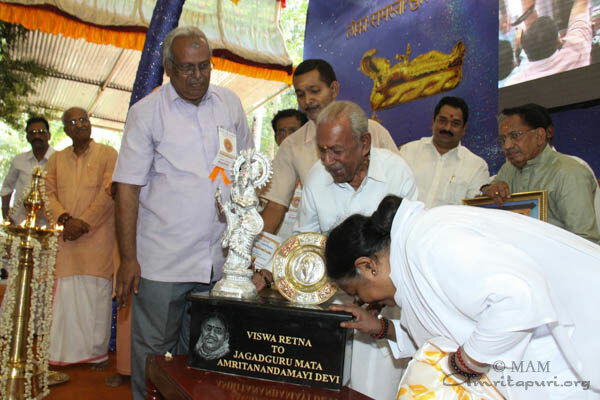 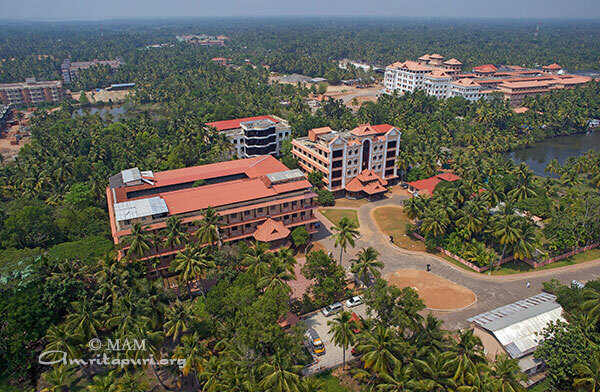 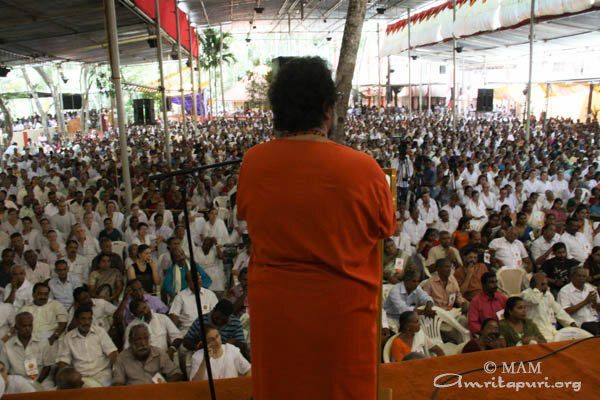 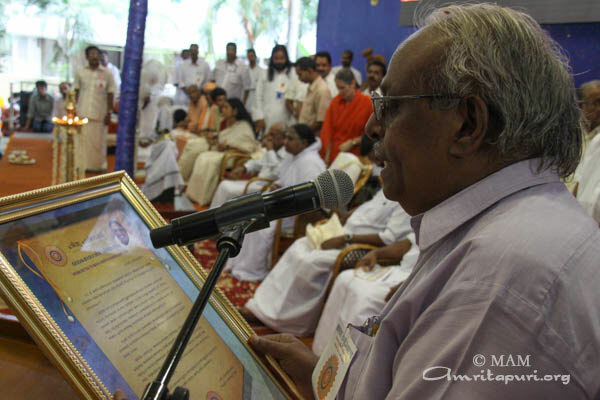 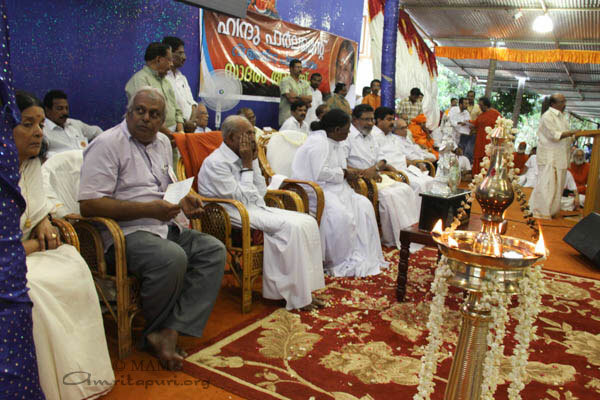 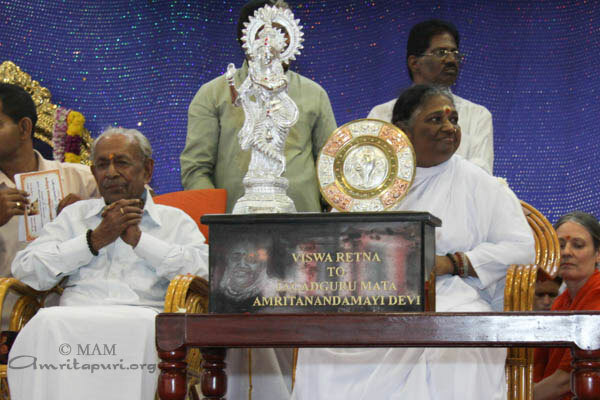 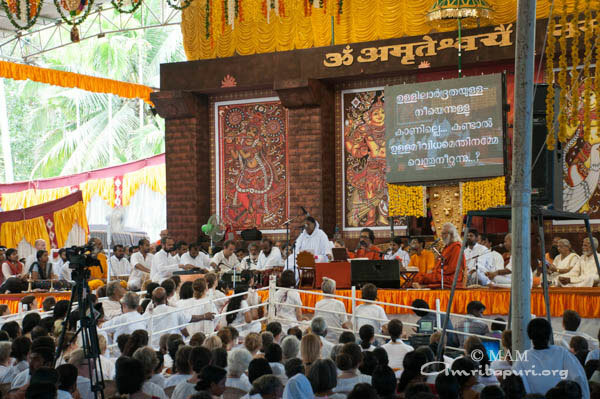 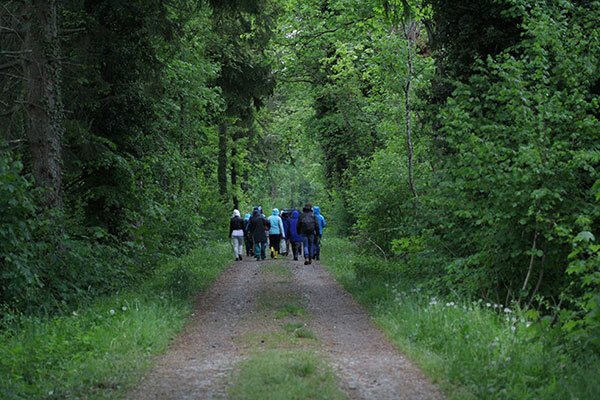 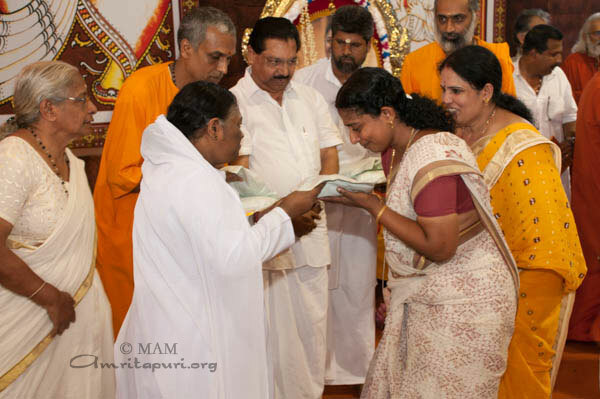 For the final stop on the 2013 Indian tour, Amma made her 25th visit to her ashram in Kodungallur. 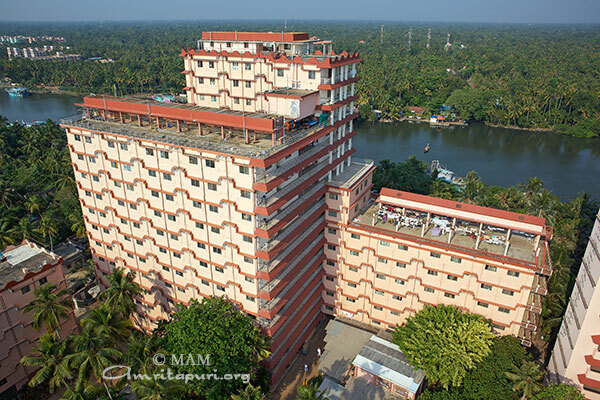 This is the site of Amma’s first Brahmasthanam temple and before beginning her darshan, Amma made a special announcement on the mic briefly explaining the history behind it all. 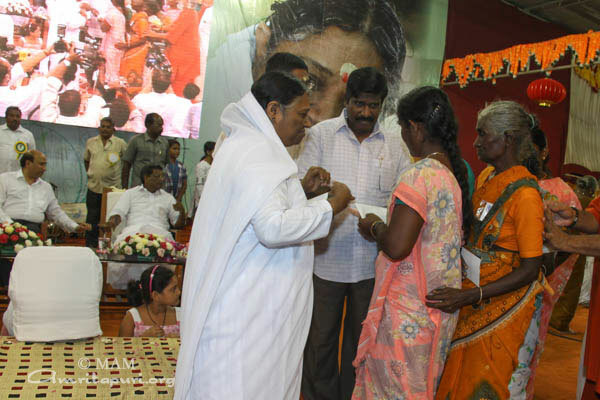 She explained how the previous family who owned the land approached Amma and offered it to her and requested her to build a temple on the site. 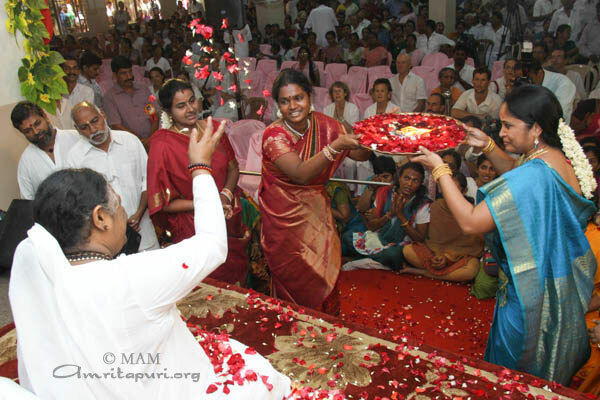 They told Amma how for countless years the land was the starting place for the annual procession leading to the local Devi Temple. 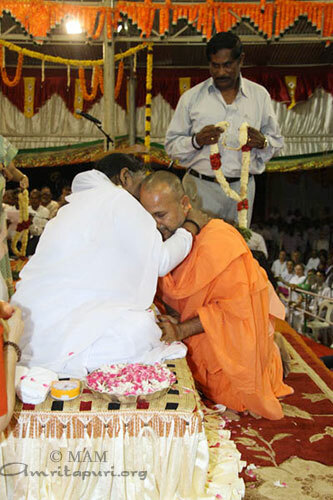 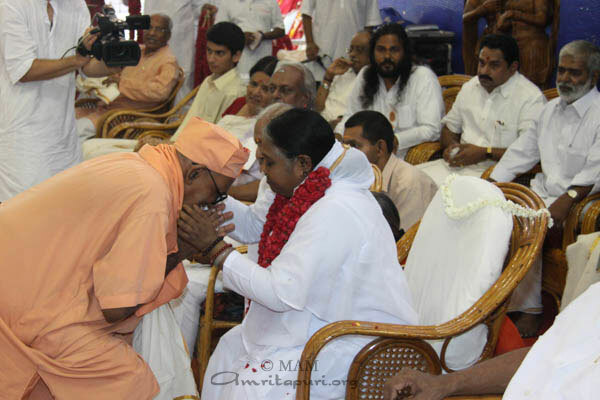 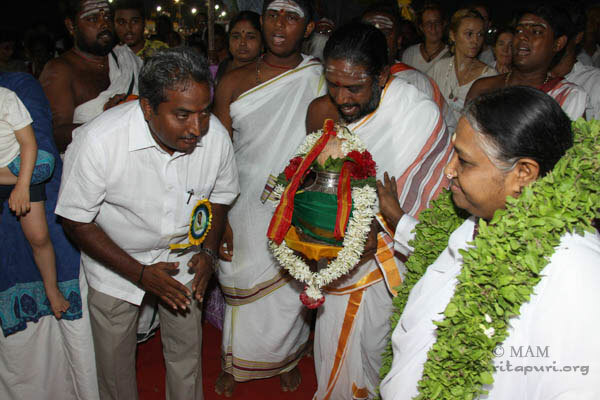 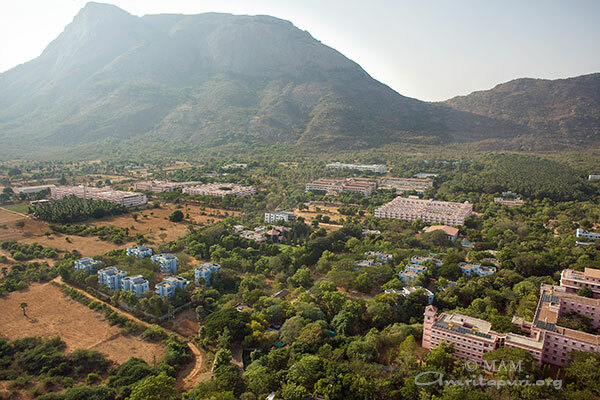 And after their insistence Amma accepted the land and in 1987 the first Brahmasthanam Pratistha was performed. 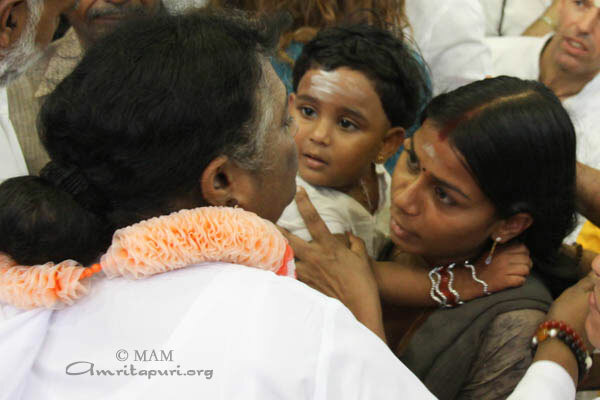 Amma then said that it was the love of her children that has drawn her back there so many times since then. 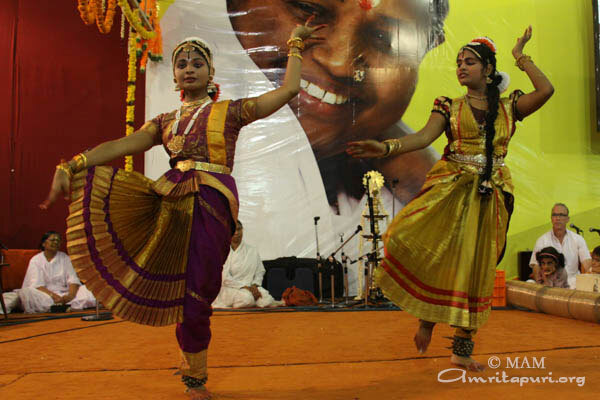 Throughout the day, students and teachers of Amrita Vidyalayam presented different dances to Amma to celebrate the occasion. 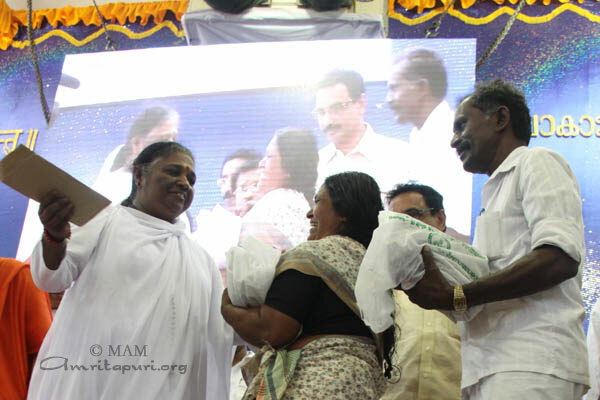 Before darshan started, Amma distributed pensions as part of the Amrita Nidhi program and seeds to cultivate organic farming. 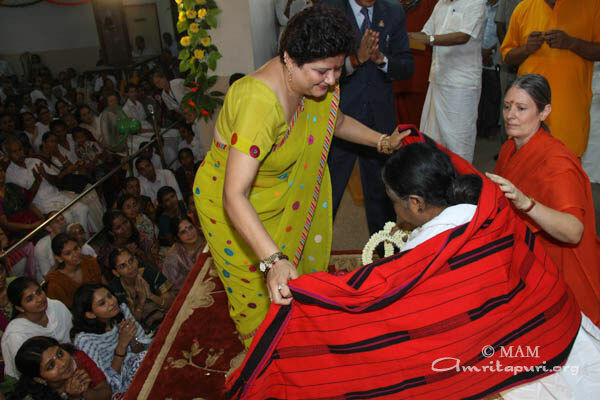 Additionally participants of Amrita Sree groups were given working capital. 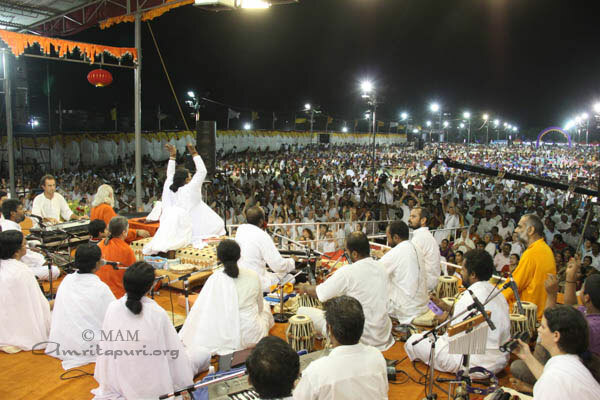 At the end of darshan Amma sang Tanana Tanana and Mayaji while everyone danced, completely rocking the hall, while it was pouring rain. 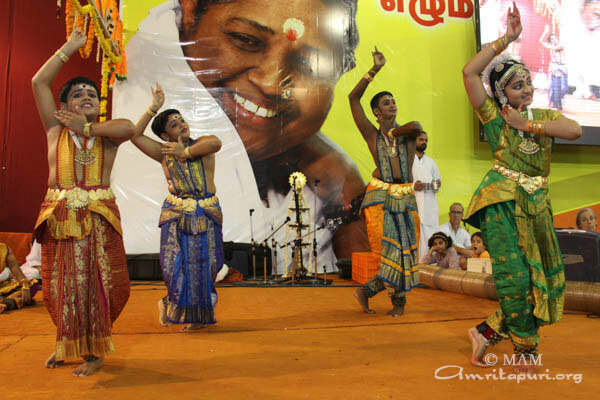 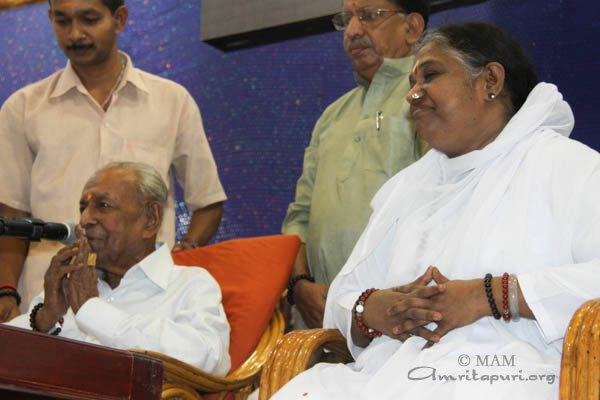 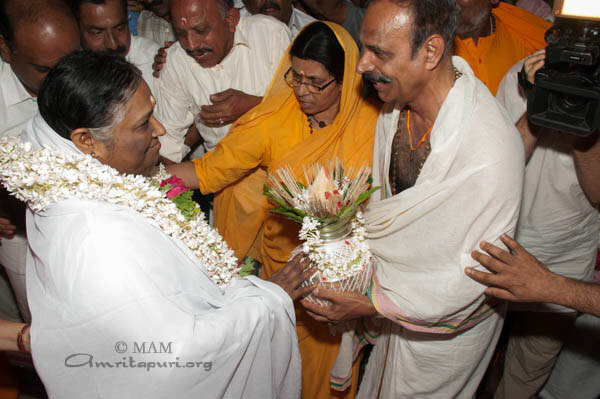 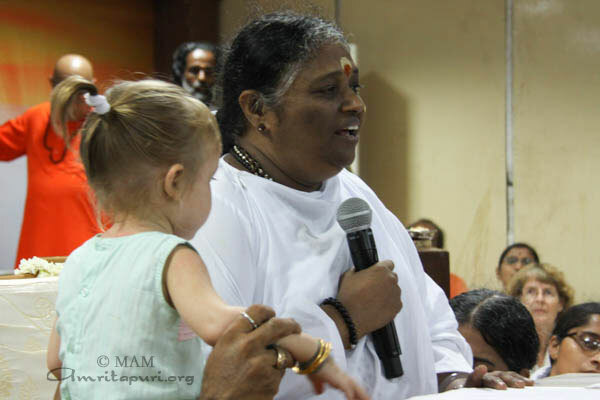 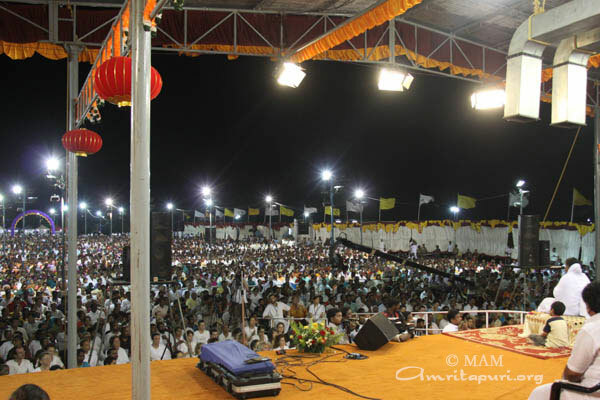 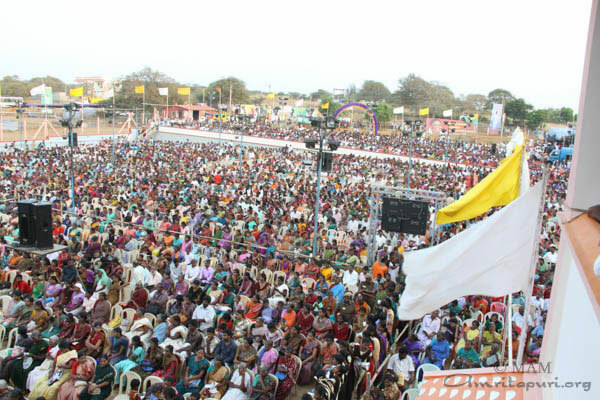 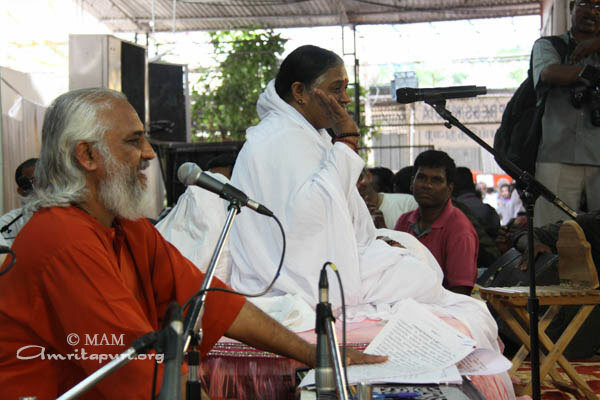 It was 6.45 in the morning by the time Amma finally left the stage, and travelled back to Amritapuri to conclude the tour. 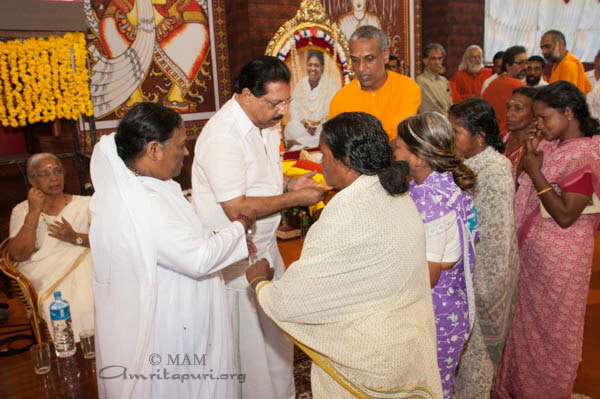 On 12th February, when Amma reached the Talassery ashram, she was welcomed by devotees, eagerly waiting to catch a glimpse of her, before next day’s programs. 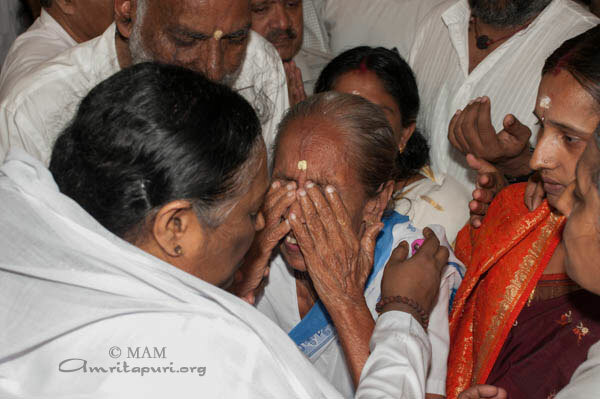 The scenes of her arrival and the love of the devotees was very touching to witness as always. 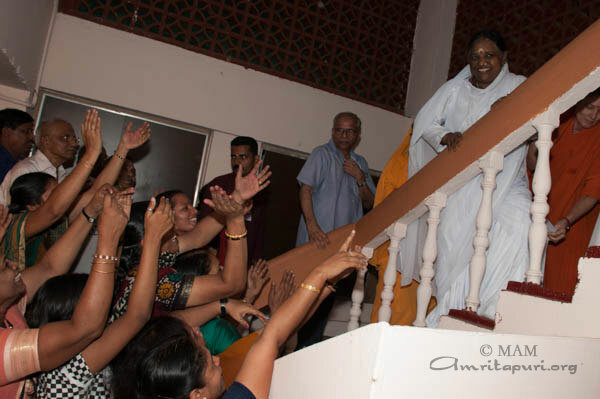 Amma slowly made her way to her room surrounded by the crowd of adoring hearts. 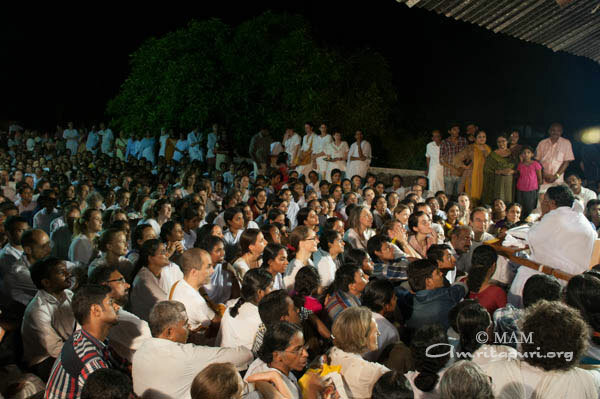 Few moments later she emerged out and went straight to the roof where she had invited all the devotees and the tour group for a dinner/bhajan time. 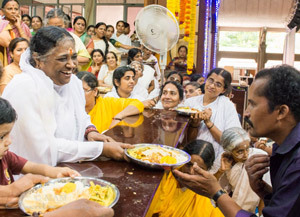 Plates were passed around by Amma, while she was simultaneously giving directions to create space for everyone to fit in the place. 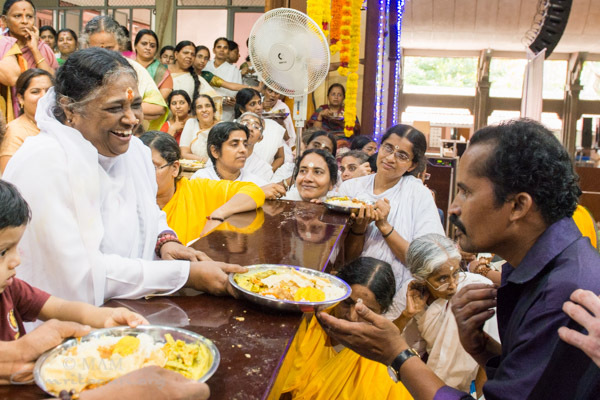 After dinner, Amma sang bhajans, then she asked for ashramites to tell jokes and make everyone enjoy a moment of laughter and lightness. 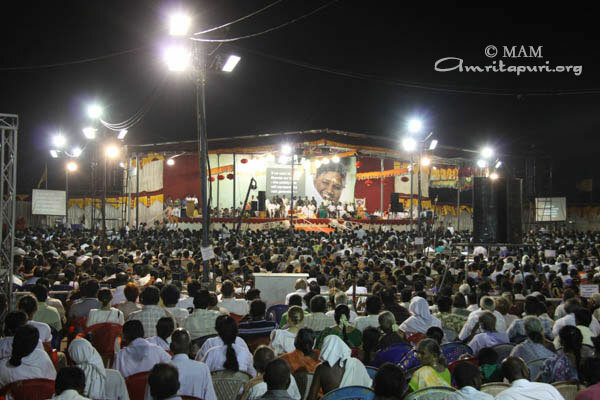 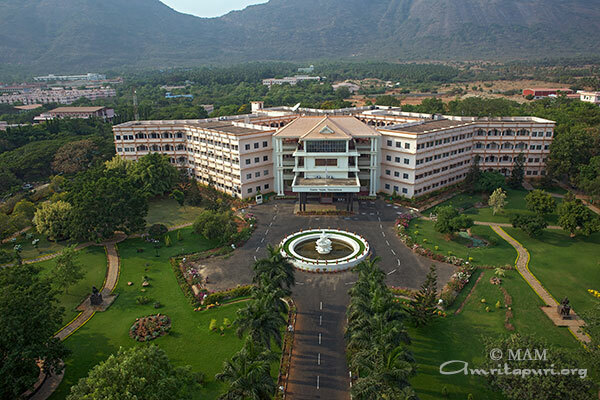 It was passed 10pm when this memorable and precious time took end, with Amma commenting on various practical spiritual topics. 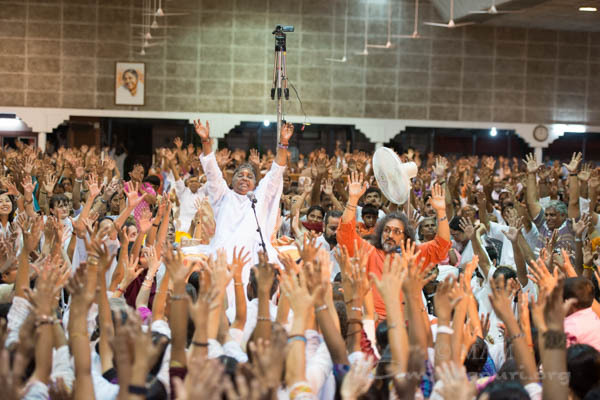 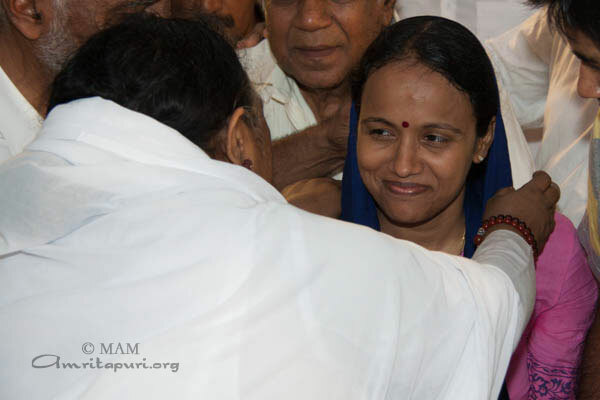 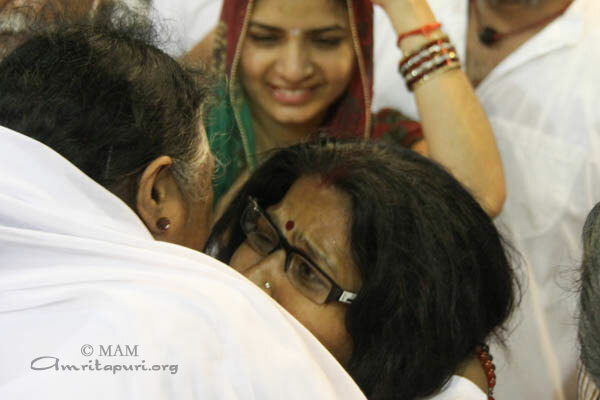 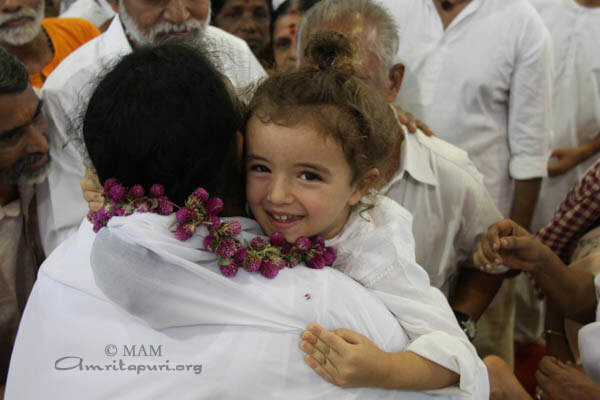 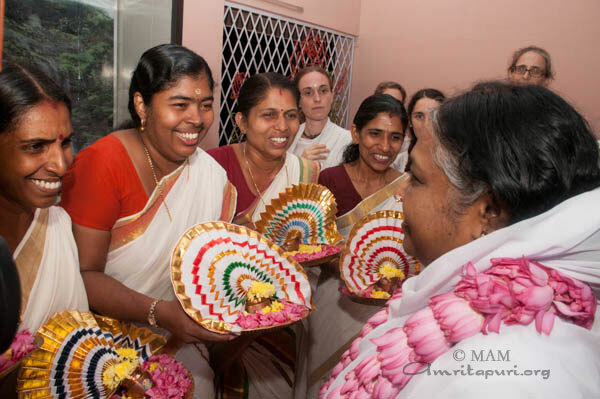 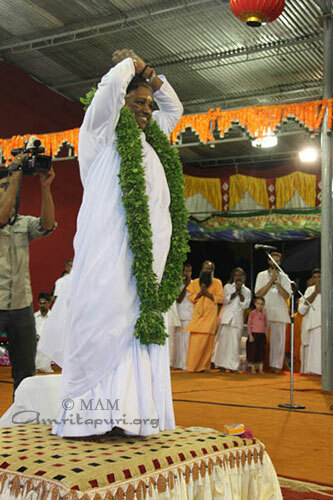 As Amma headed for her room, everyone left the roof with happy and fulfilled faces and hearts. 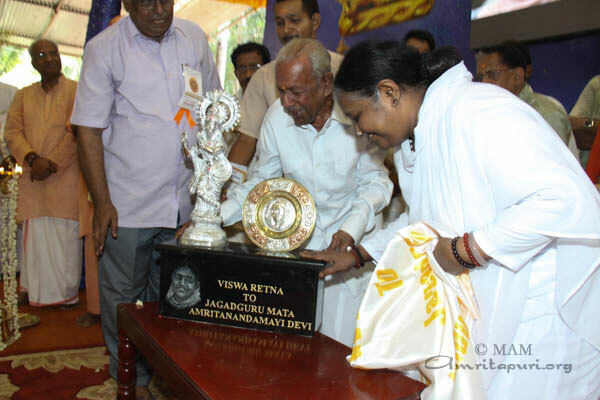 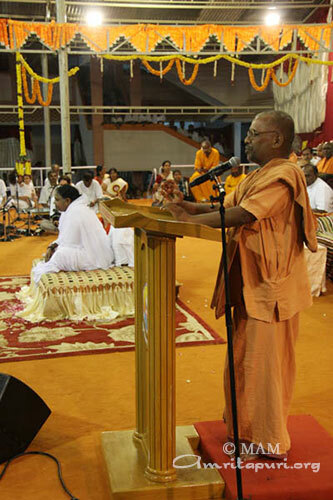 Next day morning, Amma came to the stage around 11am. 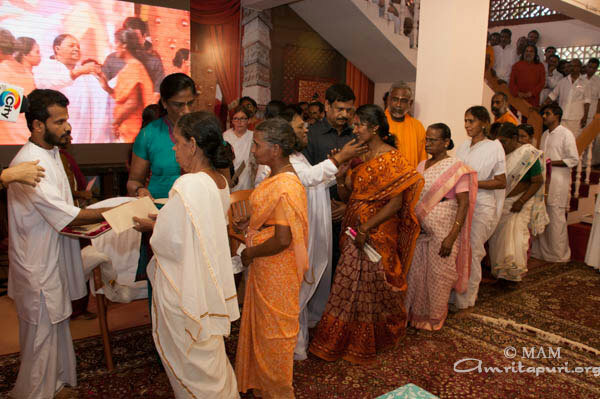 An Indian Olympian athlete PT Usha and R Arunachalam, Mahe State Administrator, were invited to the stage, as Amma distributed Amrita Nidhi pensions. 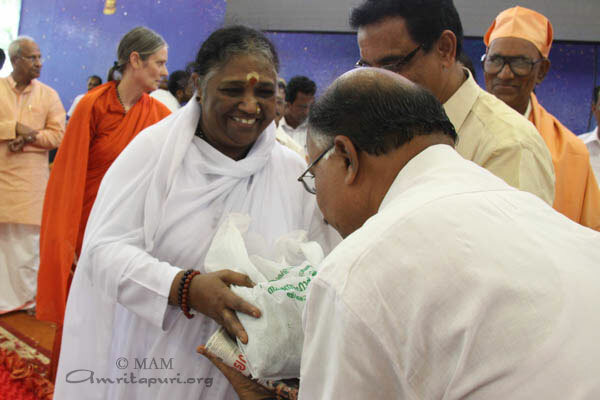 Seeds to cultivate organic farming were also distributed to devotees. 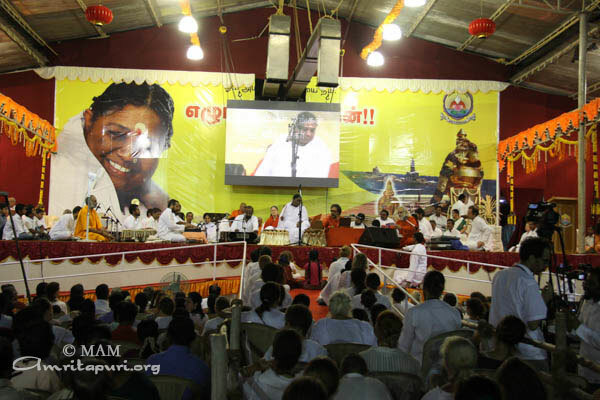 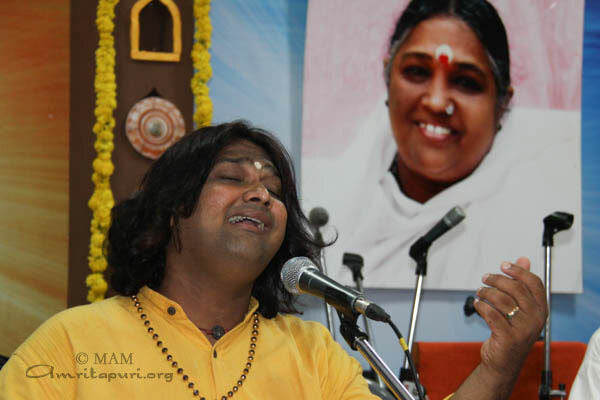 Amma lead a beautiful bhajan session, followed by a satsang, meditation and prayers. 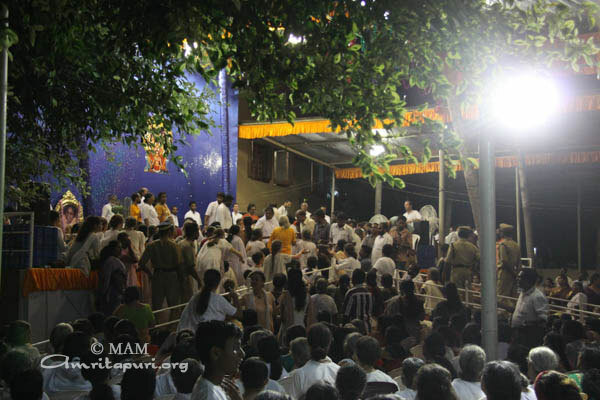 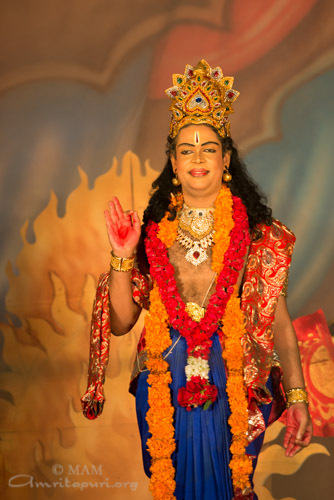 Darshan went on throughout the afternoon, evening and passed midnight, ending around 3.30 am. 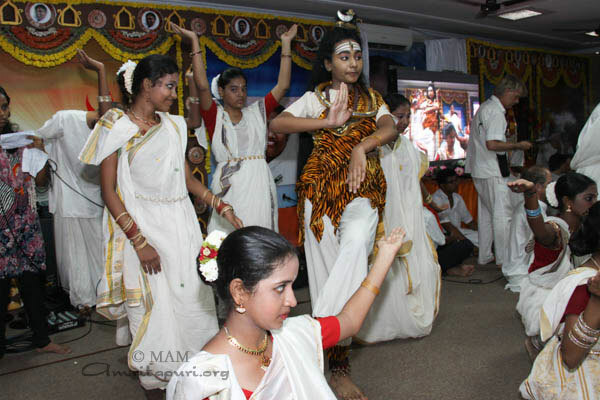 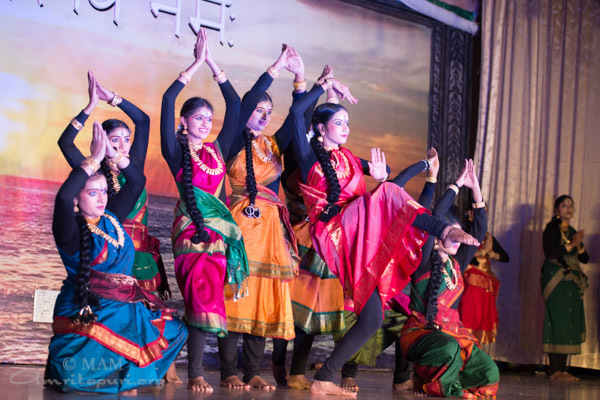 The children from Amrita Vidyalayam offered many dancing performances.